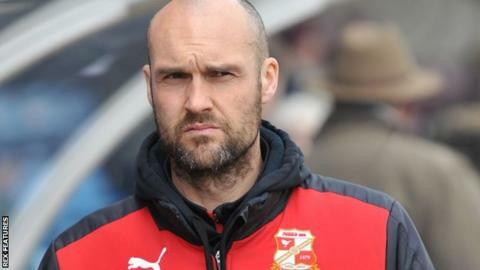 Swindon Town head coach Luke Williams has apologised to the club's fans after a thumping 6-0 loss away at Scunthorpe in League One on Monday. The defeat, which followed Saturday's 4-1 home loss to Wigan Athletic, was Swindon's heaviest since a 7-1 reverse at Nottingham Forest in February 2006. Williams' side had not lost in seven games prior to the Easter weekend. "I'm the first person that needs to be held accountable for this performance," he told BBC Wiltshire. "I don't fully understand the reason for the incredibly poor performance. I know we are missing some important players but there is no reason why we should perform that badly. "I can only imagine it is a lack of concentration, that peoples' minds have wandered, because they feel like they have nothing left to play for. That is not acceptable. "I would even question whether one of two were 100% focused on the game. That should hurt the players." In their back-to-back losses to Wigan and Scunthorpe, Swindon conceded more goals than they had in their previous 10 matches. "I'm shocked at some of the incredibly lacklustre performances and what appeared to be some people downing tools at one point in the game," Williams continued. "What you are doing is showing everybody that, when things get tough, you're not the type of character that is able to dig in deep. "I apologise to the fans that came to watch us and support us and expect to see total commitment from the players. I need the players to respond and to try to bounce back from this." Swindon host Fleetwood on Saturday before trips to Oldham and Bradford on 5 and 9 April respectively.